Iguazu falls is also known as Iguassu located on the Argentina and Brazil border. 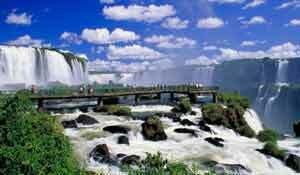 The amazing waterfall touches Parana region in Brazil and Misione region from Argentina. The Iguazu falls separate the river into upper and lower Iguassu. A Spanish conquistador Alvar Nunez Cabeza de Vaca discovered this beautiful place in 1541. During the end of 19th century, Boselie rediscovered the garrulous falls. The Iguazu falls contain a total of 275 falls and 2.7 kilometers in length. Some falls are at a height of 269 feet. About half of the river water flows into a gulf know as â€œThe Devilâ€™s Throatâ€. The particular gulf is U-Shaped, 82 meters in height, 150 meters in wide and 700 meters in length. Iguazu falls divide the Argentina and Brazil into two countries and 2/3rd of the falls lie on the Argentina province. Either from Brazil or Argentina province the tourists can reach the falls. Millions of years ago, a volcanic eruption was the cause for the creation of the Iguazu falls. The US First Lady Eleanor Roosevelt titled this falls as â€œPoor Niagaraâ€, after seeing it the first time. The Union falls is the largest waterfall at Iguazu Falls. This falls is nearly three times as wide as Niagara Falls and wider than Victoria Falls. On an average, about 1,500 cubic meters of water flows from the falls every second. A Brazilian army officer conceived an idea of establishing a National Park at Iguazu fall in 1897. 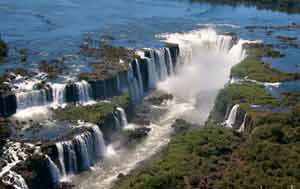 As per his wish, Iguazu National Park was set up in the Argentina in 1934. Similarly, Iguazu National Park was established in Brazil too in 1939. Iguazu National Park, Argentina won a title as a World heritage site in 1984 whereas Iguazu National Park, Brazil also claimed the same title in 1987. The tourists can enjoy a boat ride on the waterfall and can capture the waterfall views from all angles. The rainy season starts from December to March in Iguazu falls whereas the expected weather is humid and sometimes the river overflows on the walkways. At this time tourist may find difficulties to see the falls. January to February, June to July are the peak seasons here. The National parks turn busy and expensive during these months. May and September are the right time to visit Iguazu falls since the weather stays pleasant along with the meager crowd. The parks are kept opened from 8:00 am to 6:00 pm between April and September & 7:30 am to 6:30 pm between October and March. USD 40 is the entrance fee to the Iguazu National Park and the concerned collect the amount in Argentine pesos. This is a world heritage property located in 169,695.88 hectares in the State of ParanÃ¡, in southern Brazil, adjacent to Iguazu National Park. This is a fully protected area and restricted to the non-destructive use of natural resources. The Itaipu dam is 7919 meters length, 196 meters height which is equivalent to a 65-storey building. Visitors can visit the inner section of the dam. Special services such as bilingual guides, a documentary exhibition on the Itaipu auditorium along with a special bus on the board are available. It is a seven-step tour takes around 2 hours and 30 minutes. It is one of the largest Buddhist temples in Latin America. The Asian community built the temple in 1996 which is being the place of peace and tranquility. The temple is set in 42 acres of gardens. The temple encompasses 120 statues. 7 meter sitting Buddha statue is the highlight of the temple. This Buddhist temple is kept open from Tuesday to Sunday and admission to the temple is free. Bela Vista Ecological Refuge, Ipora dance show, Cataratas JL Shopping, Mosque of Omar Ibn Al-Khattab, Catedral Sao Joao Batista, Acquamania Foz, and Bosque Guarani zoo are the attractive places to visit. The Belmond Hotel das Cataratas suits for the high-end traveler, the Boutique Hotel de la Fonte, and San Martin Resort & Spa are comfortable for mid-range tourists. San Juan Eco Hotel and Hotel Pousada Rosa are being the budgetary hotels. All these accommodations are within 5 km radius of the Iguazu Falls.